Breathe new life into your old, scuffed-up speakers with the Gator Cases Stretchy Speaker Cover, which is designed to fit popular PA speaker cabinets ranging in size from 10-12". Even if your portable speakers still look new, the GPA-STRETCH-10-B Stretchy Cover will give your setup a polished, professional look that is ideal for high-end corporate events, churches and weddings. 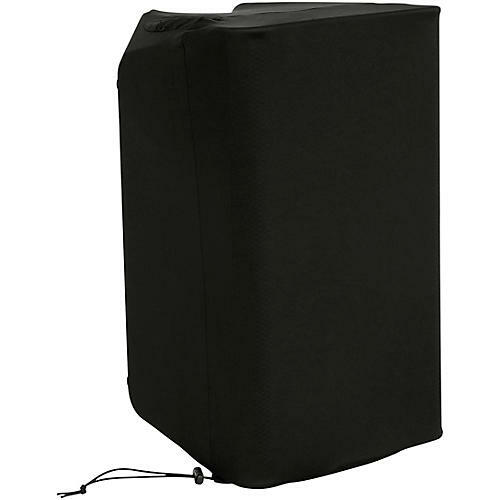 Made from a fire-retardant, acoustically transparent material, the Gator Cases Stretchy cover is easy to install on both powered and passive portable PA speaker enclosures, and features a cinch cord to ensure a snug, secure fit. The result is a clean, classy appearance that blends in effortlessly with any environment. So, even if you're just tired of seeing the dated styling of your old, faithful speakers—but they still sound great—the GPA-STRETCH-10-B Stretchy Cover will make your system look new and modern. Not only is this stretch speaker cover easy to install, it's easy to care for, thanks to the premium-quality, machine-washable material. Wash after wash, the Stretchy Cover will retain its clean, professional appearance. Fits most portable PA speakers from 10-12"